Who can resist a photo booth? LONDON IS A CITY OF AMAZING DIVERSITY, on so many levels. We did our best to eat globally. I'll start off this story with my favorite overall meal and experience of London. 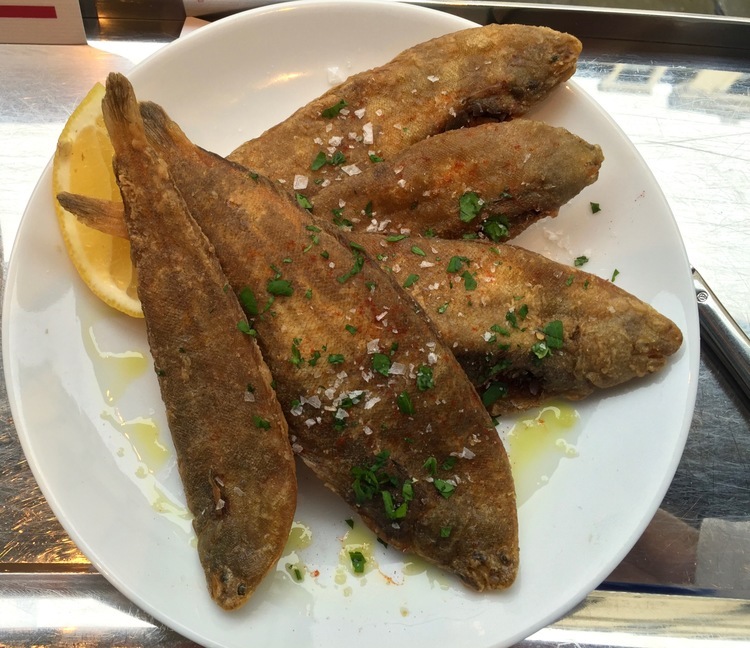 It was a visit to Barrafina, an authentic Spanish Tapas Bar on Adelaide Street in Covent Garden. Top left: Calçots and Romesco (Grilled leeks with a classic red pepper and nut based sauce with toasted almonds) Top right: Escalivada con Pan de Coca (Roasted vegetables, typically tomatoes, eggplant and peppers with crusty bread) Bottom left: Yellow Chicory, Don Bocarte Anchovies and Salmorejo (Salad of Endive, watercress, fresh Anchovies with a creamy tomato-bread sauce) bottom right: Crispy Sole Acedias, with lemon, olive oil and herbs. This is such amazing food market. 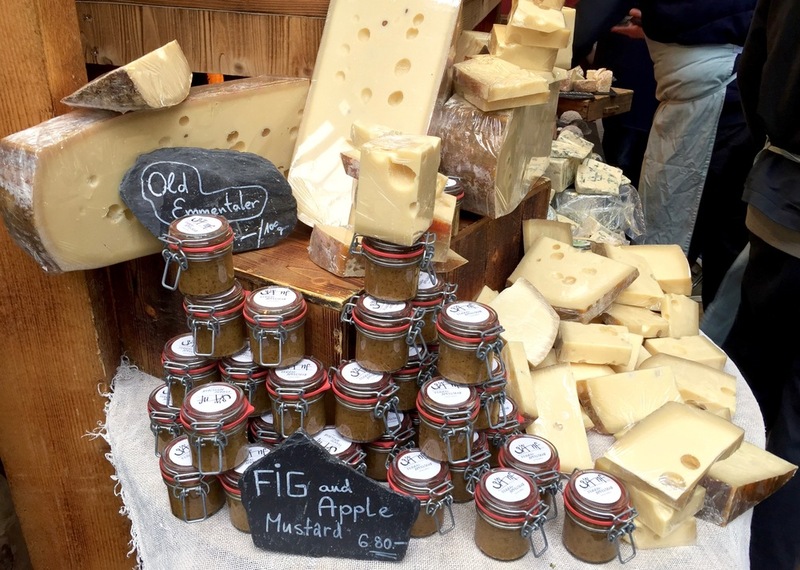 Cheese mongers are well represented at Borough Market, including the renowned Neal's Yard Dairy. There is an amazing selection of seafood, meats, condiments, produce, breads, pastry, desserts and much, much more. Through the market and out the back are vendors offering cooked food from across the globe. Our favorites were dumplings and cheese toasts (see below). 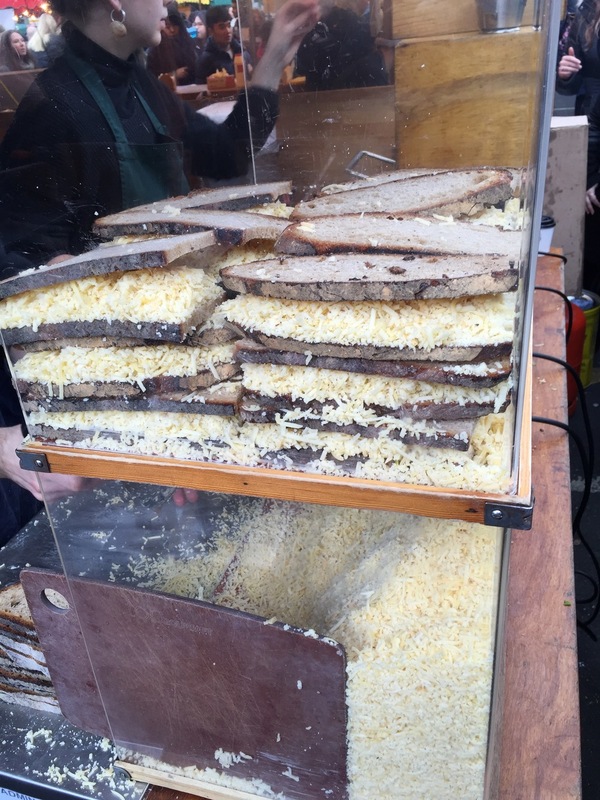 Found in the market as well, makes one of our all-time favorites Cheese Toasts…to die for! I know it seems so simple...toasted bread and cheese. But Kappacasein has it down. While waiting in line for this delicious sandwich we studied how they are made and what we couldn't figure out we asked. Sliced Poilane sourdough bread filled with grated cheese (Montgomery cheddar, Comté and raclette) and a sprinkle of finely diced onions (red and white onions, leeks, and rumor has it there is also garlic) The bread not buttered, but browned in a panini press. Once you take a bite, you can hear the Hallelujah chorus singing! If there were one place that I had to see before leaving London, it would be an Ottolenghi deli (gourmet prepared take out) or restaurant. I have been cooking from, and inspired by their cookbooks for a few years. They are filled with delicious recipes that are rooted in Middle Eastern cuisine. Each book has stunning photographs that are beautifully styled. 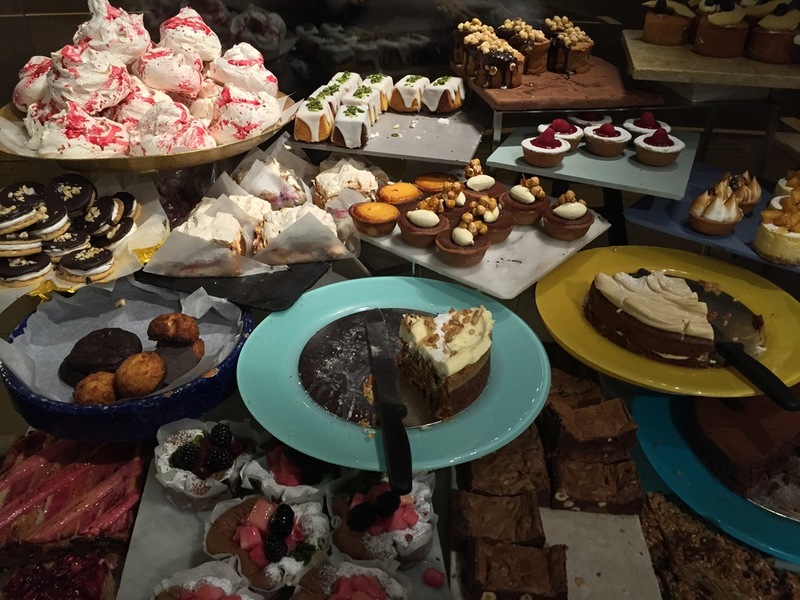 We popped in to the restaurant/deli in Islington, to see first hand those gorgeous tiered displays of their food both sweet and savory (pictured in this story’s cover photo and banner image above). From the display (room temperature) Roasted eggplant with black garlic yogurt, Urfa spiced peanuts, spring onions and chives;* Mixed green beans and peas with toasted mustard seeds, red onion, garlic and chili. Then from the kitchen (hot) Pan fried seabream, coco beans, Nocellara olives, winter tomatoes and salsa verde and Sardinian squid stew, fregola, fennel, and jalapeño (pictured above). *Everything was delicious, but the winning dish of the evening was the eggplant; and it was the top 5 dishes of my trip…really amazing! My Ottolenghi cookbooks. There are 5 books now, the newest called Nopi, named after their upscale venture, an all-day brasserie in Soho. Capturing the food before we dig-in. Johanne had the same idea. 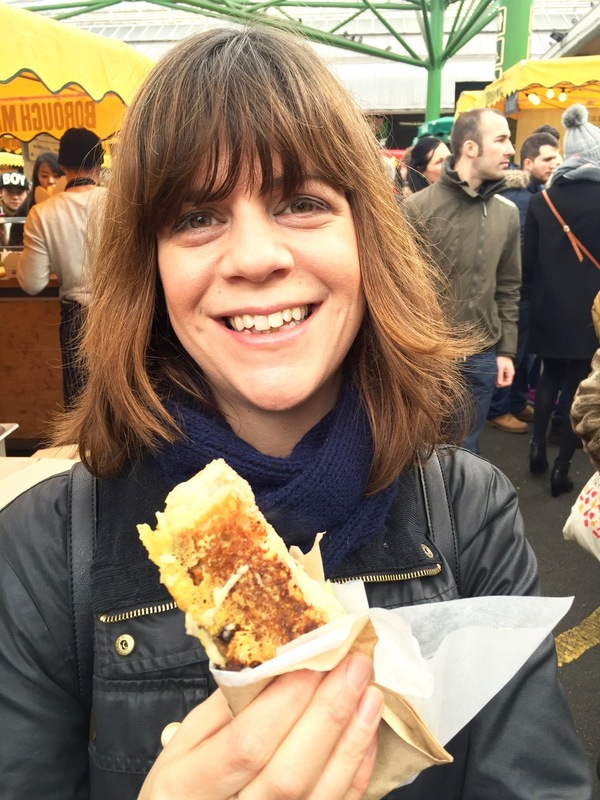 One thing I left out when talking about Borough Market was running into two fellow American foodies, Eli Zabar and Johanne Killeen. I had mentioned earlier that Abi and I met working as food stylists on the Barefoot Contessa show, which is hosted by the one and only Ina Garten; and one of the great perks of the job has been all of the amazing people we’ve had the opportunity to meet. So you can image how incredible it was to run into Eli and Johanne who have both been guests of the show. For New Yorkers, Zabar’s is a household name synonymous with great food. It’s in his blood. Eli Zabar has a gastronomic empire studded with incredible gourmet gems throughout NYC’s upper east side. Joanne Killeen is the chef/owner of the acclaimed Alforno Restaurant in Providence, Rhode Island, and a cookbook author. The next day we met up for brunch at Dishoom, in Shoreditch. A restaurant inspired from the tradition of the old Irani cafes in Bombay. Kejriwal - Two fried eggs on chilli cheese toast. Bombay Omelette - A crazy-paving three-egg omelette of chopped tomato, onion, coriander and green chilli. Azuri - An Irani café staple. Three spicy scrambled eggs piled up richly alongside plump pau buns and served with grilled tomato. Also sides of Masala beans, Fried Chicken Livers and Sausages. 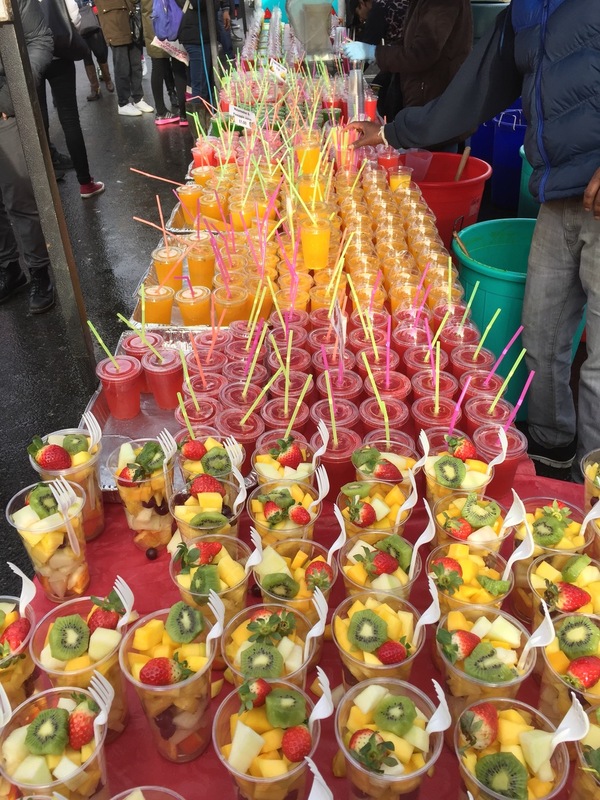 Brick Lane Market is a colorful and vibrant street long flea market, which includes several food vendors. In addition, The Old Truman Brewery at 91 Brick Lane, houses Sunday Upmarket; with several more food vendors and artisans selling fashion, art, home furnishings and more. Stoke Newington...this wonderful neighborhood is where I stayed. 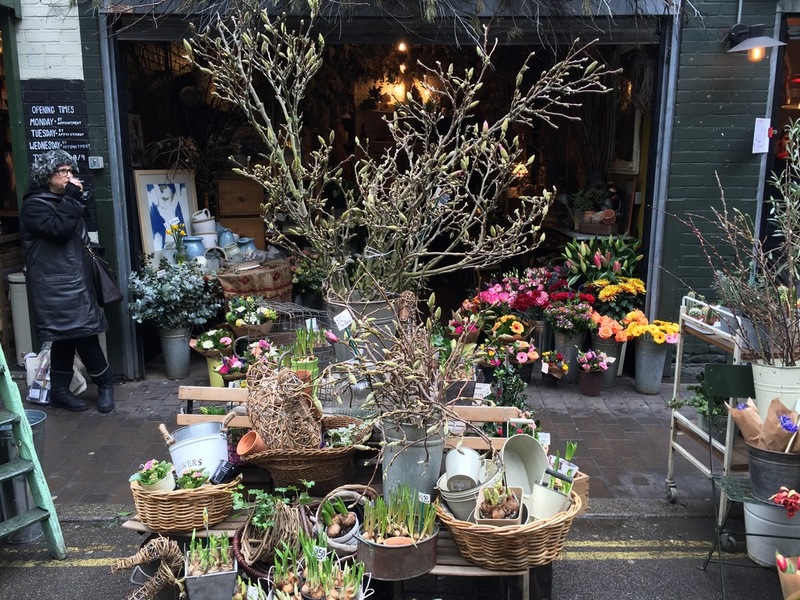 It's so charming with lots cafes, bakeries and floral shops. There are great design stores, the kind of place you'll buy unusual gifts as well great home decor. You know it's a trendy neighborhood when you find a small Whole Foods! The restaurants are not to be overlooked...here's one of many. At Rasa we started with, Achappam, Pappadavadai and a selection of chutney’s. Then Nair Dosa, Stir Fry of Cabbage, Spicy potatoes and Coconut rice. Amazing! On our final meal we went to Soho for Asian food. 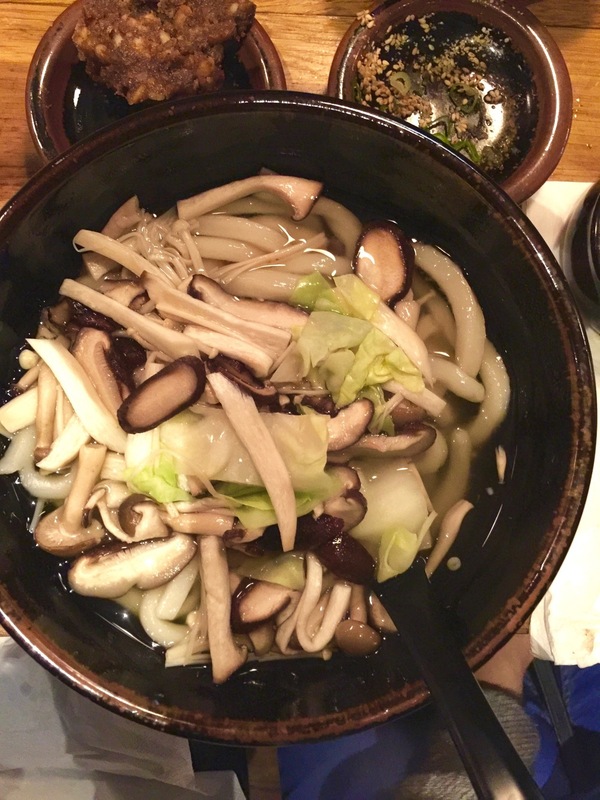 We started at Jen Cafe for dumplings; then to Koya Bar for udon noodle soup (with homemade noodles) and vegetable tempura - on steroids. See for your self - the batter was light, airy and crispy . Besides food, here are some things that caught my eye. Ted Delano - Website and technical advisor. I applaud your efforts to help me become self sufficient...one day soon! Abi Fawett - For being such a great friend, and for hosting & curating an amazing week in London.